Battery Monitor is a simple tool written in Python3 and PyGTK3. 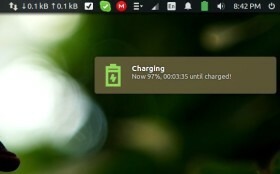 It notifies battery status of charging, discharging, fully charged through desktop notifications. When the battery is below 10%, it plays a sound and pops up a notification bubble. No command typing on terminal, no extra indicator, the tool just pop notifications when the battery status changes. So far, Ubuntu 16.04 and Ubuntu 14.04 are supported. 2. For those who don’t want to add PPA, grab the .deb installer from the release page. Once installed, launch the tool via command battery-monitor for the first time. Or just restart, it will start in background automatically at login. And remove the PPA if added via Software & Updates -> Other Software tab.